This is "Snow" Cute! Scroll over the image with your mouse to see the amazing detail! We all love the magic of Christmas, and snow globes have an added magic of their own! "Snow Globe Village" by Arlene and Melissa of The Quilt Company, has captured this with 8 magical snow globes that include a trio of Owls singing "Joy to the World", a Skating Penguin with red paper clip Skates, Santa & Mrs. Claus holding a "Dear Santa" Letter and a Snowman Baker that is called "Bake & Shake"! There's also a Snow Lady Quilter with her own holiday Quilt! 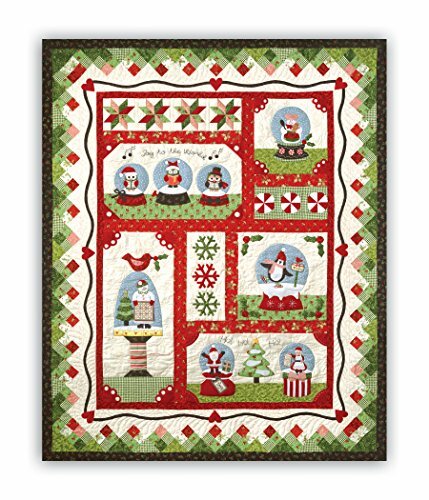 Snow Globe Village Features the "Songbird Christmas"" by Maywood Studio fabrics and the finished quilt measures 54" x 66 ¾", which is perfect to showcase in a favorite spot. We offer this in 2 versions - Block of the Month, or All at Once, and the kits include all of the exact fabric required to complete the quilt top as shown, including binding and easy-to-follow instructions. CHRISTMAS QUILT KIT - Same Fabrics as Original! If you have any questions about this product by Homespun Hearth, contact us by completing and submitting the form below. If you are looking for a specif part number, please include it with your message.